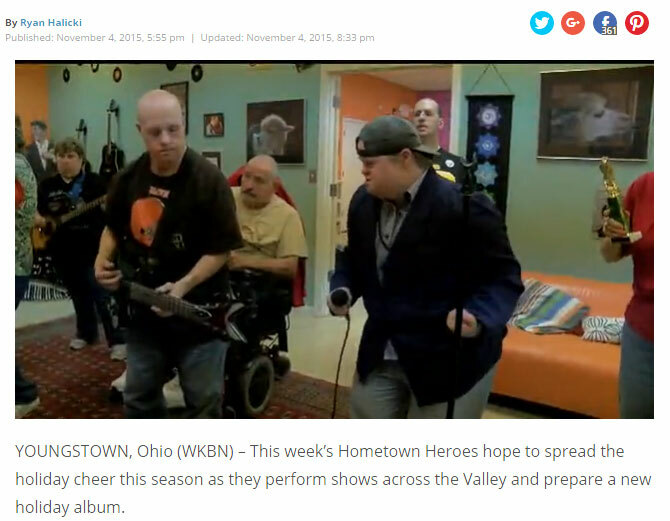 YOUNGSTOWN, Ohio (WKBN) – This week’s Hometown Heroes hope to spread the holiday cheer this season as they perform shows across the Valley and prepare a new holiday album. The Purple Cat Music Class in Youngstown is a new program, part of the Purple Cat on Pearl Street in Youngstown, designed to provide adults with disabilities therapy through music. But for those who are part of the Purple Cat’s “band,” they are rock stars. Just ask Mark Castro, who, despite having special needs, is a multi-talented musical artist. Castro can play keyboard, drums and has even written his own songs. “This is the very first band featuring folks with disabilities and special needs, which is really cool, too,” he said. The group performs a variety of covers and has a few original recordings as well. All members offer a wide range of talents — from vocalists, guitar players, keyboardists and percussionists, all under the guidance of band leader Jason Murphy. “I couldn’t ask for a better band than this. This is amazing, and it has changed my life, as well as theirs,” he said. Murphy, a musician who was once a part of band himself, brought his skills to the table but said the Purple Cat Music Class has exceeded his expectations. While some choose to strum along to the music, others surprised him with their talents. One such band member is Kristin Seidler, a multi-talented musician who often plays guitar, cowbell and who even duets with band member, Castro. She said the group has a lot of fun together. “I love it. These guys are all my friends, and it’s just like, you’re just having a good old time with your friends. So it’s just having a great time,” she said. “I’m telling you what – we all just love it here. It’s absolutely fantastic and has changed our lives,” Castro said. The band is working on an all-original album and hopes to have fans at two upcoming performances. “Early December, we’re doing the B&O Station, and after B&O Station, we’re doing First Night Youngstown, and we’re really excited about that,” Murphy said. Seidler said, along with original songs “Reveal How I Feel,” written by Castro, and “Shut Your Mouth,” the band will also perform popular songs that those in attendance will have heard before. To stay updated on the group’s upcoming performances, or to find information on the band’s next album release date, you can follow the group’s Facebook account. The Purple Cat was founded in 2003 to offer day-program alternatives for adults. Clients participate in a range of vocational functions, creative projects and classes to develop daily-living skills. Read the article on WYTV here.